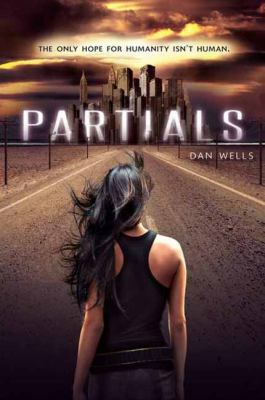 Posted on October 6, 2016 by Anmol K.
Partials by Dan Wells is an action-packed novel about the remains of humanity after a devastating virus kills 99.99% of the human population. The story takes place 11 years after the virus, RM, is exposed. Kira. the main character, is training to be a medic and interns at the only hospital. There is no cure for RM, so when babies are born they die within a couple of hours. RM is said to come from humanlike creatures called Partials. It is believed that they have the cure since they released it. The urge to cure RM becomes stronger for Kira when she discovers that her best friend, Madison, is pregnant. She figures that her best bet would be to capture a Partial and bring it back. After embarking on a dangerous journey, Kira manages to bring one back. She is given five days to study the Partial, and to collect as much data as possible. Unfortunately, she is not able to complete her research because of unrest among the remains of the human population. They are angered by their government, and have become restless after hearing that a partial has been brought back. After the riots settle down, Kira discovers a startling secret about herself. It may make her reconsider everything she has ever known. Overall, the book had an amazing plot. Partials had one of the best plot lines among recent dystopian novels. A major problem with this book was it dragged on and on for pages at certain points. It was as if the author just put in extra filler pages. The only thing that kept me reading was the plot-line. I wanted to see what would happen and if the cure for RM would be found. Something that I also enjoyed about this book was the whole conflict between humans and Partials. Initially, they were groups against each other; by the end of the novel, that relationship changes drastically. Partials is available for checkout from the Mission Viejo Library. This entry was posted in Book Reviews and tagged science fiction, survival, viral epidemic by Anmol K.. Bookmark the permalink. I’m a big fan of these kinds of series, and the next time that I go to the library I am definitely going to check it out! I am happy to say that I read this book, and it is really interesting and incredible. This is a good book by Dan Wells.